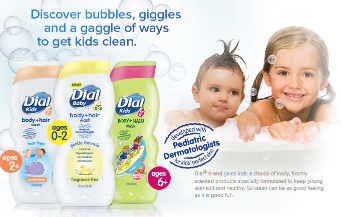 Dial Baby Body + Hair Wash & Dial Kids Foaming Hand Soap Review & Giveaway – Win a FREE bottle! I am so excited! I have some new products to tell you about and a giveaway! Two of my readers will each win a coupon for a Free bottle of Dial Baby Body + Hair Wash or Dial Kids Foaming Hand Wash (note, it’s one coupon, but you get to choose which product you want for Free – just one product). This time my son got to be the product tester for me. Even though he’s 14, he tested out the Dial Baby Body + Hair Wash and the Dial Kids Foaming hand soap. The Baby Body Wash is unscented, so that was great for my older kiddo, who would prefer not to smell like a baby! The Dial Kids Foaming Hand Wash is watermelon scented (Watery Melon), which is always a big hit at our house! My son immediately liked the body wash! He thought it made his skin feel soft and it rinsed off well. For me, I appreciated a break from his recent “Manly-scented” body wash. Not that they smelled bad or anything, but they certainly don’t smell like a kid! Too grown-up smelling and a strong scent, too. Unscented was a pleasant change for both of us! As for the hand soap, it’s great – lots of bubbles, amazing smell and of course, does a good job cleaning your hands and rinsing off easily! Both these products got a big “thumbs up” from my son. Giveaway ends May 7, 2015 at 9pm PT. *Note: I was given a free bottle of Dial Baby Body + Hair Wash and Dial Kids Foaming Hand Wash in exchange for my fair and honest review of the product. I was not paid to review this product and all the opinions stated here are mine. Coleman “Camping Kit” Sweepstakes – Win Coleman camping products! Win a Coleman Camping Kit pack! ENTER SWEEPSTAKES HERE – Coleman Sweepstakes page. ENTRY LIMIT – Limit one (1) Entry per person, and limit one (1) Additional Entry per person during the Promotion Period. ELIGIBILITY – Open only to permanent legal residents of the 50 United States and the District of Columbia (and excluding Rhode Island) who are 21 years of age or older at the time of entry. 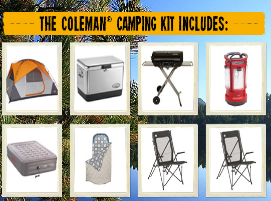 SWEEPSTAKES PERIOD – The “Coleman® Camping Kit” Sweeps (the “Sweepstakes”) commences at 8:00:01 AM Eastern Time (“ET”) on April 27, 2015 and ends at 11:59:59 PM ET on June 11, 2015. PRIZES – One (1) Grand Prize winner will be randomly drawn from among all eligible Entries received. 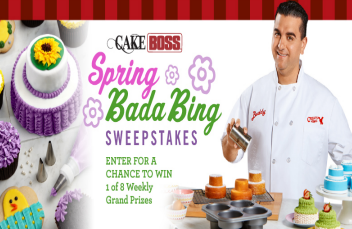 The Cake Boss Baking “Spring Bada Bing” Sweepstakes – Win Cake Boss baking tools! Win Cake Boss baking pans and tools! ENTER SWEEPSTAKES HERE – Cake Boss Baking Sweepstakes page. ELIGIBILITY – The Cake Boss Baking “Spring Bada Bing” Sweepstakes Promotion is open only to legal residents of the fifty (50) United States (including the District of Columbia) and its territories, is at least eighteen (18) years old, and have reached the age of majority in the state or territory of residence at the time of Entry. SWEEPSTAKES PERIOD – The Promotion starts on Friday, April 24, 2015 at or around 10 AM Pacific Daylight Time and ends on Monday, June 15, 2015 at 11:59 PM Pacific Daylight Time. PRIZES – One type of prize is available to be won in this Promotion: eight (8) Grand Prizes total. EACH GRAND PRIZE CONSISTS OF: (1) Cake Boss® 4-Cup Round Cakelette Pan (ARV $33.98), (1) Cake Boss® 11.5” Spoonula (ARV $17.98), (1) Cake Boss® Beechwood 7.75” Offset Icing Spatula (ARV $17.98), (1) Cake Boss® 2-Color Icing Bag & Coupler Set (ARV $26.00), (1) Cake Boss® Fondant Ribbon Cutter (ARV $39.98). (ARV for each Grand Prize: $135.92). 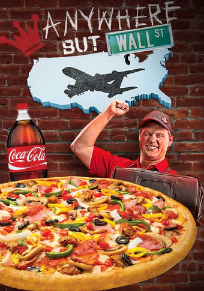 Coca-Cola Anywhere But Wall Street Sweepstakes & IWG – Win a trip to anywhere in the 48 contiguous US! Win a trip for 4 to anywhere in the 48 contiguous United States! ELIGIBILITY – The Anywhere but Wall Street Sweepstakes and Instant Win is open only to legal residents of the 48 contiguous United States (or the District of Columbia), excluding Florida and New York, who are 18 years of age or older at the time of entry. SWEEPSTAKES PERIOD – The Promotion begins at 12:00 a.m. Eastern Time (“ET”), April 27, 2015, ends at 11:59 p.m. ET, August 2, 2015. 1 GRAND PRIZE: Trip for 4 to anywhere in the 48 contiguous United States awarded as 3 nights’ accommodations at Sponsor’s choice of hotel (double room, double occupancy) and 4 airline vouchers each redeemable for round trip flight (details determined by Sponsor in its sole discretion). Terms and conditions of vouchers apply. Use by expiration date printed on voucher. Failure to use voucher prior to the expiration date will result in prize forfeiture. All terms and conditions of vouchers apply. Approximate Retail Value (“ARV”): $5,175. 3 FIRST PRIZES (1 awarded during each Entry Period): Topper’s swag bag which includes an assortment of Topper’s merchandise. ARV: $104. 490 SECOND PRIZES: $10 Topper’s gift card, terms and conditions apply. ARV: $10. L’Oréal Paris Women of Worth Sweepstakes – Win a trip to NYC & more! Win a trio to NYC & more (2 winners)! ENTER SWEEPSTAKES HERE – L’Oréal Sweepstakes page. ENTRY LIMIT – Limit one (1) entry per person, per email address, per household for the duration of the Entry Period. ELIGIBILITY – Open only to legal residents of the fifty (50) United States and the District of Columbia, 18 years of age or older at time of entry. SWEEPSTAKES PERIOD – The L’Oréal Paris Women of Worth Sweepstakes starts on March 24, 2015 at 12:00 PM Eastern Time (“ET”) and ends on June 1, 2015 at 11:59 AM ET. PRIZES – GRAND PRIZE: Two (2) potential winners will receive two (2) round-trip tickets to New York City for winner and guest to attend the L’Oréal Paris Women of Worth Awards Ceremony. Trip consists of roundtrip, coach class air transportation from a major US gateway airport nearest winner’s residence to New York, New York. Approximate Retail Value (“ARV”) $1,000. ARV $1,500; ground transportation, ARV $1,250; makeover and hair styling, ARV $650; dinner for two, $500 and gift card, ARV $3,500. Gift card is subject to certain terms and conditions as specified by issuer. Total ARV of Grand Prize, $8,400. 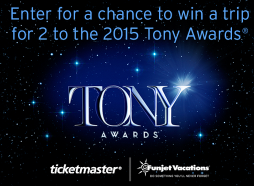 Ticketmaster Mother’s Day Sweepstakes – Win a trip to the Tony Awards! Win a trip for 2 to the Tony Awards at Radio City Music Hall! ENTER SWEEPSTAKES HERE – Ticketmaster Sweepstakes page. ENTRY LIMIT – Each participant is eligible to submit up to one (1) Promotion entry during the Promotion Period, regardless of method or combination of methods of entry or number of entries submitted. Multiple entrants are not permitted to share the same email address or other relevant account. ELIGIBILITY – The Ticketmaster Mother’s Day Flyaway Sweepstakes is open only to natural persons who are legal residents of the United States of America, and who are at least eighteen (18) years of age at the time of entry. SWEEPSTAKES PERIOD – The Promotion period begins at 12:00 PM Pacific Time on April 27, 2015 and ends at 12:00 PM Pacific Time on May 9, 2015. PRIZES – One (1) Grand Prize consisting of a 69th Annual Tony Awards Flyaway which includes two (2) reserved tickets to The 69th Annual Tony Awards at Radio City Music Hall event (“Event”) scheduled to take place on June 7, 2015; round-trip charter/value economy airfare for two (2) on Funjet Vacations value flights from a major gateway airport nearest winner’s residence in the continental U.S. to New York, NY departing on or about June 5, 2015 and returning on June 8, 2015; one (1) double occupancy standard hotel room for three (3) nights / four (4) days; and a $200.00 pre-paid cash card to use toward ground transportation. Approximate Retail Value of the Grand Prize is: Four Thousand Three Hundred Dollars ($4300), depending upon winner’s point of travel origin and airfare fluctuations at the time of taking the trip. Any difference between stated approximate retail value and actual value of prize will not be awarded. Olive Garden eCard Better Together Sweepstakes & IWG – Win a trip for 2 to Florida! Win a trip for 2 to Orlando, Florida! 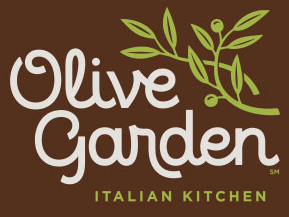 ENTER SWEEPSTAKES HERE – Olive Garden Sweepstakes page. ELIGIBILITY – Olive Garden eCard Better Together Sweepstakes and Instant Win is open only to legal residents of the fifty (50) United States (including District of Columbia) who are at least eighteen (18) years old at the time of entry. SWEEPSTAKES PERIOD – The Promotion begins on April 27, 2015 at 12:00 a.m. Eastern Time (“ET”) and ends on May 31, 2015 at 11:59 p.m. ET. PRIZES – Sweepstakes Prizes: ONE (1) GRAND PRIZE: A trip for two (2) to Orlando, FL. Trip package includes round trip, coach-class air transportation for two (2) from a major airport near winner’s home (determined by Sponsor in its sole discretion) to Orlando, FL; three (3) nights’ accommodations at a hotel determined by Sponsor in its sole discretion (single room, double occupancy); a cooking class for two (2) with Olive Garden’s Executive Chefs (all details of cooking class are determined by Sponsor in its sole discretion); two (2) tickets to a theme park (theme park and date determined by Sponsor in its sole discretion); per diem of $150 per day for four (4) days ($600 total) to cover food and misc. expenses. Approximate Retail Value (“ARV”): $3,000. TWO (2) FIRST PRIZES: A party for you and ten (10) of your closest family and friends at your Local Olive Garden. Party includes food and non-alcoholic beverages for up to eleven (11) people. Party must occur within one (1) year from the drawing date or prize will be forfeited. Party must be booked at least thirty (30) days prior so that Sponsor can work with local Olive Garden restaurant to plan event. Travel to local Olive Garden is sole responsibility of winner. ARV: $500 per First Prize. Instant Win Game Prizes: TWO THOUSAND (2,000) SECOND PRIZES: A $5 Olive Garden eGift Card. ARV: $5. 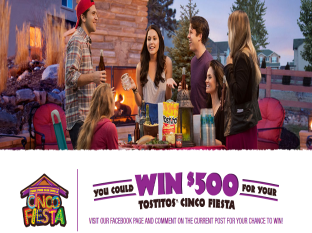 Tostitos Cinco Fiesta Sweepstakes – Win a $500 gift card! Win a $500 gift card (4 winners)! ENTER SWEEPSTAKES HERE – Tostitos Facebook page. ENTRY LIMIT – Limit one (1) Entry per Entry Period per person. ELIGIBILITY – The Sweepstakes is open only to legal residents of any of the 50 United States and the District of Columbia who are 21 years of age or older at the time of entry. SWEEPSTAKES PERIOD – Sweepstakes begins at 9:00:00 a.m. Central Time (“CT”) on April 19, 2015 and ends at 11:59:59 p.m. CT on May 1, 2015. PRIZES – Prize (4, 1 per Entry Period): Each winner will receive a $500 gift card which may be used towards winner’s own “Cinco Fiesta”. Gift cards are subject to terms and conditions as set by issuer. Approximate Retail Value (“ARV”): $500 each. 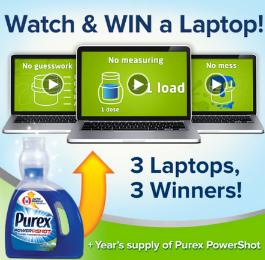 Purex “Watch & Win with Purex PowerShots” Sweepstakes – Win a laptop & more! Win a $350 gift (for a laptop) and a year’s supply of Purex Powershot (3 winners)! ELIGIBILITY – The “Watch and Win with Purex Powershot” Sweepstakes is open to legal residents of the fifty (50) United States and District of Columbia, who are at least eighteen (18) years old at time of entry. SWEEPSTAKES PERIOD – Sweepstakes starts on or about 12:00 PM Pacific Time (“PT”) on April 7th 2015 and ends at 3:00 PM PT on April 30th 2015. PRIZES – Grand Prize (3): Three grand prize winners will receive a laptop in the form of a $350 Gift Card & a year’s supply of Purex PowerShot ($60) Approximate Retail Value (ARV): $1,230. 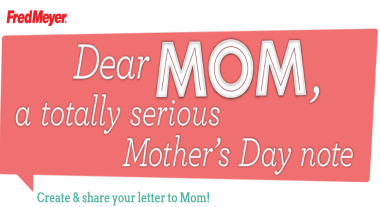 Fred Meyer Dear Mom, Dear Dad Sweepstakes – Win a $25 Fred Meyer gift card! Win a $25 Fred Meyer gift card (30 winners)! ENTER SWEEPSTAKES HERE – Fred Meyer Sweepstakes page. ENTRY LIMIT – Limit: You may enter one (1) time per day during each Promotion Period. ELIGIBILITY – Fred Meyer Sweepstakes is open only to legal residents of Alaska, Idaho, Oregon, and Washington who are at least sixteen (16) years old at the time of entry. SWEEPSTAKES PERIOD – The Sweepstakes consists of two (2) promotion periods as outlined below. PRIZES – THIRTY (30) GRAND PRIZES (Fifteen (15) awarded per Promotion Period): A $25 Fred Meyer gift card. Terms and conditions of gift cards apply.